Yes, this is kind of a big deal! Not every vintage gets this select classification and the rave reviews like 2013! Produttori Del Barbaresco wines are made from a collective of 50 growers, who, in good grape years, will make vineyard designate wines out of the grapes in their region. They only grow nebbiolo fruit and they only make Langhe Nebbiolo. In exceptional vintages, when ripening is consistent across 9 Crus, a special Riserva is released after four years of aging. Produttori was founded in 1958 with an inaugural membership of 19 growers and 110 hectares, led under the Barbarescco Parish Priest, Don Fiorino Marengo. The membership controls 1/7th of the cru region. The collective was originally formed as a type of insurance policy; if one grower had a bad harvest than the other members could sustain that grower until the next year's harvest. "Day after day, generation after generation, fifty families work the precious Nebbiolo vineyards to produce the best grapes. The fruit of their work is delivered in the Cellar they founded in 1958 where, with care and respect, it is transformed into Barbaresco wine: each glass carries within itself an extraordinary story of men and women made of tradition, effort and pride." These are the wines we'll be tasting at the Produttori tasting on Friday the 27th. I special ordered a case of each Cru last year and when they are gone...they are gone! 1. Asili, South-West exposure, 230-290 meters A very famous historic vineyard that produces wines that have always been sought after by collectors and enthusiasts. The Asili wines are always very intense and complex, rather closed in youth, but very elegant.Vinified by the Producers since 1967. 2. Montefico, South - South East, 230-260 meters. Little known vineyard, but much appreciated in the area for the great classicism of the wines. The high limestone content of the soil gives powerful tannins, full structure and great minerality in the finish to the wines of the Montefico among the most austere, but also among the most elegant of the entire production area. 3. Montestefano, South - South East, 230-280 meters. Nicknamed Barolo di Barbaresco, it is the vineyard that gives wines among the most structured and that is why it is very famous and sought after. 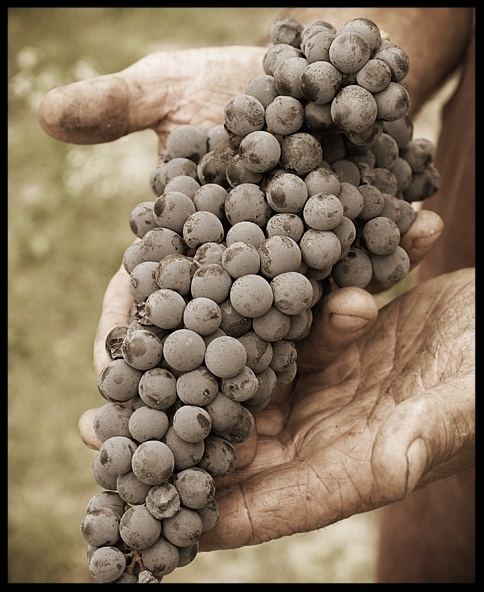 On average higher than the Montefico and even more sheltered from the northern winds, it has a warmer microclimate, which gives the fruit a more mature, almost smoky smell with a full and powerful body. 4. Muncagota, South-East, 250-300 meters. Calcareous soil with a high calcium content that gives powerful tannins combined with an elegant fruit with frequent floral notes. It has always been one of the historic areas for the Barbaresco Producers that produced this vineyard for the first time in 1967 under the name Moccagatta. In the official 2007 classification, the dialectal version of the name, Muncagota, was chosen, which is therefore the final version, but it is the same vineyard and the same winemakers. 5. Ovello, exposure varies, 250-320 meters. The area of vello occupies the northernmost part of the municipality of Barbaresco and is a wide hill with both West / South-West and East / South-East exposures. However, the different deposits have a similar soil with higher clay content than other vineyards and for this reason they have been grouped into one sub-area in the classification that became official in 2007. The hill of the Ovello is on average cooler, due to the higher altitude above sea level and the influence of the northern winds that reach the most part of the vineyard without hindrance. These pedoclimatic characteristics give more aggressive tannins in youth and a young and exuberant fruit.Produced as a Reserve since 1967, this is also a historic area for the cultivation of Nebbiolo, some vineyards of the Ovello were in fact already renowned in the late 1800s and here Domizio Cavazza, the father of Barbaresco, had properties and vineyards. 6. Paje, South-West, 220 - 260 meters. A small basin with similar exposure to Asili, but cooler microclimate due to the greater exposure to the northern currents that sometimes creep into the Tanaro valley. The wines combine elegance and freshness with hints almost mentholated in the cooler vintages. It is one of the vineyards whose wines maintain the hints of young fruit longer in time thanks to the brilliant acidity and an excellent tannic support. Produced as a Special Reserve in 1967 and then continuously starting from 1978. 7. Pora, South-West, 200 - 280 meters. The northern side is in fact a fortress overlooking the river with dense wood of oaks and other tall trees, renowned for the search for the white truffle of Alba. The proximity of the river gives the Pora a more temperate microclimate of summer mornings and a higher relative humidity. Even the soil is affected by the proximity of the Tanaro valley and shows a higher fertility compared to other vineyards. These pedoclimatic characteristics give the wines of the Pora a certain softness of tannins and make them more open and drinkable in their youth. 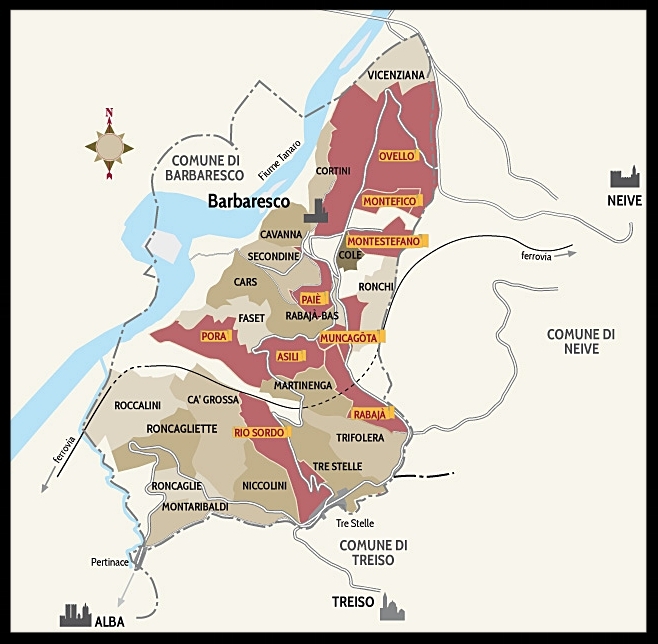 It is one of the historic areas for the cultivation of Barbaresco. Already present in the map of the vineyards edited by Domizio Cavazza in 1894, it has been produced as a Reserve since 1967. 8. Rabaja, South-West, 240-300 meters. The Cru is located at the summit meeting between the two ridges that form the heart of the wine-growing area of he Municipality of Barbaresco. The vineyard is comprised of two ridges that solidifies the balance of the vineyard. The first ridge has more loose soil, the second more compact and the two types find a balance in the Rabajà, which is in fact considered the vineyard that produces very balanced and harmonious wines where elegance and power blend perfectly. The exposure is South-West, therefore warm, and gives a rather ripe fruit, less fresh and floral than other vineyards especially in the sunniest years.Bottled by the Producers for the first time in 1971 when the Ristorante Guido di Costigliole d'Asti bought the entire production making it famous among fans all over the world. 9. Rio Sordo, South-West, 220-240 meters. It is a long ridge with a South-West exposure in the southern part of the municipality of Barbaresco, between the Tre Stelle hamlet and the Pora hill with a maximum altitude of 250 meters above sea level, the lowest of the Producers' Crus and not far from the Tanaro river. The soil is clayey limestone, as in the rest of the Barbaresco area, with low-medium calcium percentages that give non-dominant and silky tannins.The fruit is elegant, but the wine has structure and is able to age for many years. Produced for the first time as a Reserve in 1978.